The P-40 was one of those aircraft which would be characterized as 'the best that we have for the moment'. Though nearing obsolescence even when the war broke out for America in late 1941, the truth was that there wasn't anything better to be used. More potent aircraft like the P-38, P-47 and P-51 were being developed and wouldn't see combat for a year at the best. So, like in all wars, one fights it with what one has and hopes for the best. Fortunately, the P-40 had already been tried in combat by the British in North Africa and so the results of that experience were added to the later versions coming off the line. Truth is that at low level, the P-40 was a pretty good fighter. A bit heavy compared to some, but able to withstand a lot of damage and able to carry a respectable load of ordnance. An experienced pilot was able to do well in the Warhawk if they took advantage of its heavy armament and high diving speed to do hit and run attacks. In a dog-fight, especially against Japanese planes, it was not at its best. Even when it was surpassed by other types, the P-40 soldiered on until late 1944 with the USAAF in the Pacific/CBI and even longer with some Allied nations. The most widely produced version was the P-40N. It was a result of extensive weight reduction and had the most powerful Allison engine that would fit into the airframe. It was also equipped with drop tank or bomb racks and provided good service in the fighter-bomber role. All but the very early P-40Ns could be distinguished by the altered canopy section to the rear that provided better rear view. Not surprisingly, most surviving P-40s are this version. Hasegawa jumped on the engraved panel line bandwagon in the early/mid 1980s and this was one of a number of WWII fighter kits that they produced. 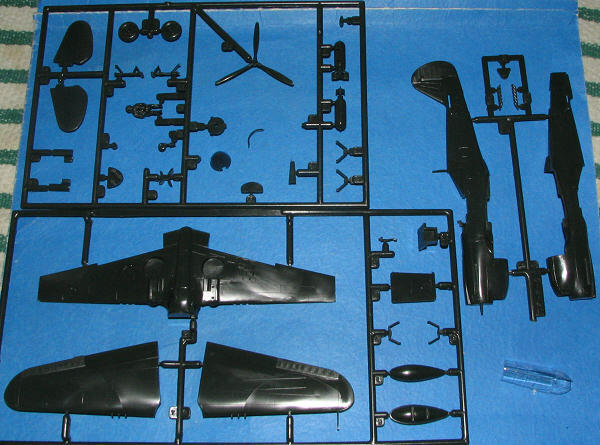 It was still before the 'do multiple versions with one basic set of sprues', but you'd also find the two larger sprues with their P-40E kit; the smaller one with the fuselage containing the N specific bits. For a goodly amount of time, the US importer, Minicraft, reboxed these with English instructions, different decals and lame box tops. Even though tens of thousands of these kits have been produced, this must be a fairly early kit as it is still in Hasegawa's dark green plastic. However, it does have some fairly large sink areas on the upper a lower flaps, one of the problems of having thick plastic on a part. The flaps and ailerons are molded on the upper wing halves. There are also some small sink marks opposite alignment pins/sockets. Easy enough to deal with for most of us and a great chance to learn the use of filler for the newbie. Probably the weakest part of this kit in the minds of many is the cockpit section. There is a generic tub with molded in seat and a control stick. The instrument panel blank is set to accept a decal. Much of this Spartan approach still continues with Hasegawa 1/72 kits, though not quite to this degree. Fortunately for us all, there are aftermarket resin cockpit sets for these kits so we can really fix things up. The canopy is a one-piece affair and quite clear. Vacuform replacements are also available for those interested. Wheel wells are a respectable depth and have sufficient detail for most. Gear are well done and quite scale as are the diamond tread tires. Again, resin replacements are available. Some consider the prop to be a bit narrow, but it looks fine to me. The only underside options are a single bomb or drop tank. Markings are provided for a single aircraft of the 51st Fighter Group based in India during 1944. 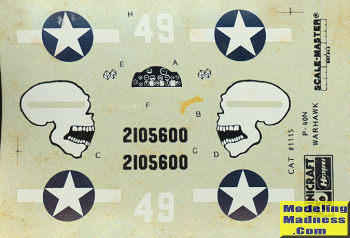 This is the same set of markings as one of the Hasegawa kit options, but with better decals. It is in standard OD over neutral grey. 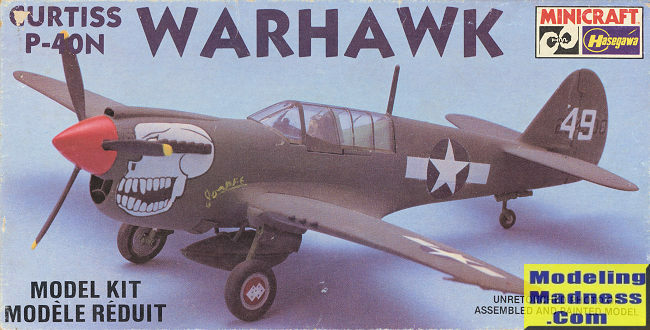 There are quite a few aftermarket sheets for the P-40N out there so you don't need to feel you are stuck with doing the very popular skull motif. I have built a number of these kits, both right from the box and with the addition of aftermarket goodies. They make into very nice models and while not as new as the Academy versions, I still think that you'll be pleased with the results. Thanks to me for providing this kit for you.